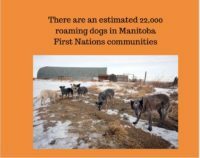 If you follow the TAGS website or social media you will have noticed a lot of dogs and puppies from Manitoba since November of 2017. You might be asking yourself why we choose to help these dogs over others. You may wonder why are there so many dogs? There is a crisis on First Nations reserves in Manitoba and in fact, on many across Canada. In Manitoba alone, there are 63 First Nations communities. These house approximately 200,000 people. Each community has an average of 350 “unowned” or roaming dogs. Add that up and the number is staggering. This is upwards of 22,000 dogs fighting to stay alive every day. Almost 100% of these dogs are not sterilized. What is the cause of this over population? The answer is a lack of veterinarian resources. 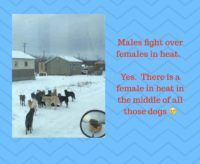 Many of these communities are remote and there is no way to have a dog sterilized. An average female dog will have had 4-5 litters by the age of 2. So just think about that…if each litter is 4 pups, that is 20 puppies born to a 2 year old female and then they start having pups. It is easy to see how the population of unwanted dogs quickly escalates. Although some dogs are kept as pets by families in the communities and are loved – there are others that are unwanted. 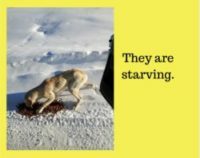 These dogs are starving and will fight for food. There is no clean water to drink. They face harsh weather conditions – extreme cold in the winter and heat in the summer. Males fight to get to females in heat. Many are diseased, full of parasites, sick, freezing, covered in ticks and many die. To control the population of these roaming dogs, they are shot by residents in dog culls. Some die from the gunshot wounds and others do not but wander injured and in pain. Dogs are hit by cars on a regular basis. Children are afraid to be outside or walk to school due to packs of dogs who can become aggressive. There are many dog attacks, some fatal. The poverty in these communities is a fact of life and families can barely take care of their humans, never mind dogs. It is just awful and impossible for us to understand the situation that these people and dogs live in but this in unfortunately, a reality in our country. 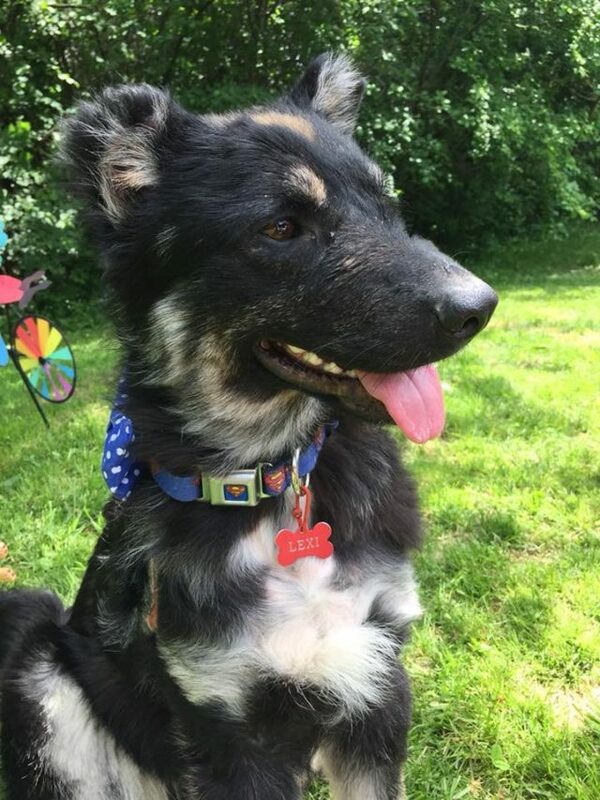 Through all of these struggles, these dogs have some of the most wonderful temperaments and just love people and want to be a part of a family. They come with very few behaviour issues outside of housetraining and some leash work. They are generally submissive and easy dogs to integrate into your home. We have teamed up with a couple of on-the-ground rescuers in Winnipeg. These volunteer groups work with communities to rescues dogs and pups daily. 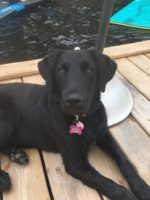 These groups save thousands of dogs yearly and work with rescues, like TAGS, and move the dogs out of province across Canada. These front line rescue groups also run spay and neuter clinics. This is some of the most important work they do. A team made up of Veterinarians, vet techs and other volunteers travel to these remote communities, set up a spay and neuter clinic in the local school or community centre for a weekend and will treat 100+ dogs. During this weekend they will educate owners, vaccinate, deworm and sterilized dogs and cats. This is also a good time for them to catalogue owned dogs in the community. During these clinics, owners will come in with dogs that have been hit by cars or caught in traps or injured by other dogs. The veterinarians will do their best with limited resources to help all dogs brought in. 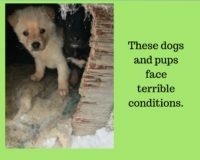 Many will be surrendered by their owners and along with some roaming dogs, will make the trip back to Winnipeg and then sent to rescue. From a TAGS perspective, our goal is to help get as many dogs and pups as possible rehomed through our rescue. We estimate we will bring in 85 dogs from First Nations areas in 2018. We are constantly in need of funds to transport dogs here and then provide full veterinarian care to them. We are also always in need of foster homes to house adult dogs, puppies, pregnant moms and moms with their litters.